How Gifting tripled my revenue. As November approached, chats & emails flooded in. My customers were trying to purchase gifts for their friends and loved ones. But there was no easy way to do it on my site, Moustache Coffee Club. Sure customers could pay for a subscription for someone else and use their shipping address but it’s weird. If I gift a subscription, am I paying $19 / month forever? How do I communicate the to receiver that I’ll be cutting them off after 3 months? Also, I felt that while customers clearly wanted to buy coffee subscriptions for their friends & family, there was still too much friction to getting it done. People didn’t know the correct shipping address, they wanted something tangible that they could gift and they wanted to be able to guarantee that an item would arrive on the day (usually Christmas morning). Obviously, I needed to figure out a solution to these problems and I decided to do what any good programmer does when he comes up against a difficult problem. I solved a different easier problem. I’m not Santa Claus, the notion of me being able to reliably deliver a parcel of freshly roasted coffee on Christmas morning isn’t going to fly (pun very much intended but I promise it’s the last). There are just too many variables that are out of my control, and people aren’t prepared to pay a premium for the service. But what I can deliver reliably anywhere in the world at a very precise time, is an email. This solved the present delivery problem. I let customers write a nice customized note (optional) and partnered it with a custom designed image that would be emailed on the date the customer wanted to the recipient. The second part of the puzzle is allowing the customer to prepay the entire gift and restrict the receiver to this length of time. I hooked into the coupon credit functionality of the site, and each gift is really just gift credit for a set amount. This works great because it allows the receiver to change the frequency of the gift or to pause and restart the gift and then later on seamlessly switch to becoming a customer. The final part of the problem (getting the correct shipping address) was solved by prompting the receiver of the gift to “claim their gift” and then enter their best shipping address. We signed the customer up for an account at that time, which meant they could get delivery emails and they knew when and where to expect the package. So did it work? Hell yeah it worked! I released this in December as Christmas was approaching. It was killer. I was able to triple my revenue. 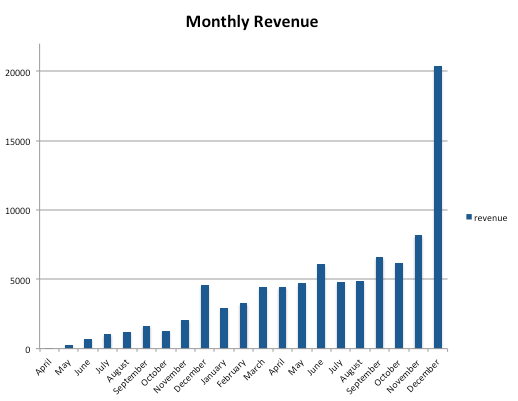 I literally saw my revenue increase from the moment I released the feature and it kept going until well into January. Moreover, it was great that we had the email address of the recipient. It allowed us to communicate with them & up sell them once the gift subscription was over. Once they had a taste, it was pretty easy to get them on board as a full subscriber. What I didn’t realize what how amazing this would be for all holidays. From Father’s Day to Birthdays to Valentine’s Day, we’ve seen a gifts spike consistently during holidays. Even Halloween is big! Seems intuitive, but it took my customers flooding me with emails for me to make it a priority. If you run a subscription box company and you like the sound of this you can use it too. 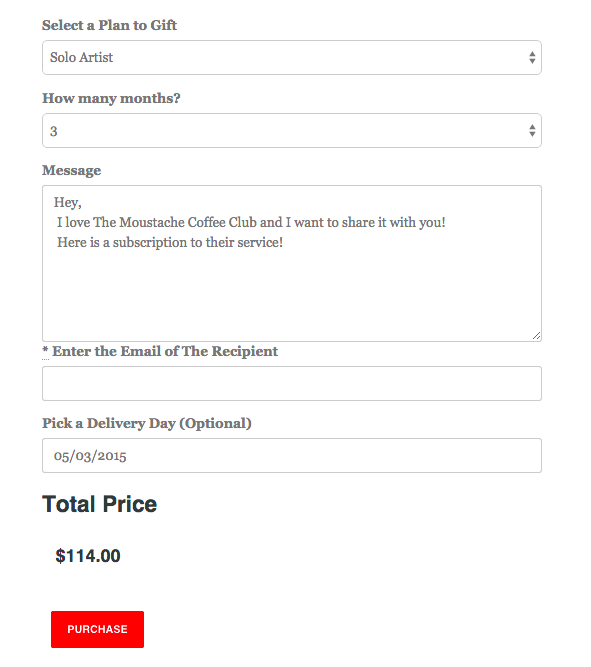 I’ve created BishBashBox which is an all-in-one subscription platform which I use to run Moustache Coffee Club (read about that story here). Simply visit BishBashBox to schedule a demo. Previous PostWhy Subscription Businesses Are The Future.